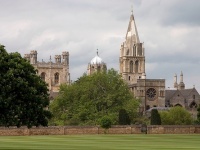 Christchurch, one of Oxford's most renowned university colleges, possesses an important collection of about 200 paintings and 2,000 drawings, mainly by the Italian masters. Works by Leonardo, Michelangelo, Raphael and Rubens are to be seen here, along with examples from Van Dyck, Frans Hals and Hugo van der Goes. The entire collection cannot be displayed at one time because of space constraints, but the exhibition changes every few months. There are also displays of 18th-century glass and Russian icons. Budget at least an hour to soak up the lovely sights.